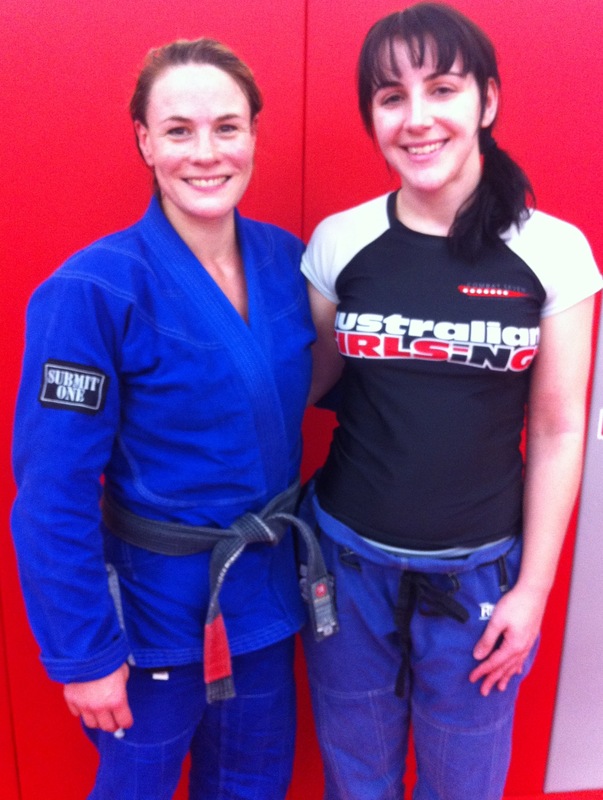 Sophia (McDermott) Drysdale, Australia’s first female BJJ black belt. Recommended by AGIG, I honestly didn’t know what a BJJ seminar involved! I was envisioning a uni lecture where you sit and listen to someone speak, and take notes. Or I figured you just watch them demonstrate moves. Thankfully I asked, found out it was more like a class and made sure I packed a gi! Cool vid put together by Jess Fraser. I brought a notebook and my phone out on the mat too, though it’s up to the individual whether they allow photos/video and since I didn’t ask Sophia before she started, I decided to play it safe and keep my phone to the side. Ditto the notebook it turned out. Other than a couple of scribbles in drink breaks and during the Q&A at the end, I really didn’t have the time or the thought to take notes. After a quick warm up Sophia got us into pairs and we took turns moving around our partner who was flat on the floor, chest to chest, arms behind our backs. It was all about using your whole body when on top to keep the pressure on your opponent, as opposed to most of the strength coming from your arms. Also altering that pressure as your opponent tries to escape (“be like a water bed”) and being on your toes so you’re able to move and adjust quickly! From there we worked on the most effective positioning when in side control, and step by step went through a few of Sophia’s favourite armbar moves. – Move on your feet, not on your knees, ‘duck walk’ around for the far armbar. – Be more parallel than crucifix to apply the correct pressure to the best areas in side control, including hip to hip. – Post/grab your gi as you’re settling in for the armbar, you don’t have to lean back for it until you’re ready. – Do your warm ups and drills fast if you want to roll fast – sprints not long runs, short but intense push ups, sit ups etc, rest then do it all again. At the end Sophia invited questions, and talked briefly about her journey through the ranks. She revealed while she never felt a BJJ gender issue in Australia, training overseas including in Brazil she was treated differently as a woman on the mat. But at the same time she says we have to accept we’re participating in a male dominated sport “you’ve chosen to be in it, don’t expect special treatment, although also don’t be afraid to speak up to say this is what I need” ie. to sit out, or to go over something again. Sophia believes there’s nothing wrong with tweaking an instructor’s move a little to make it work for you and your body. And just in case I wasn’t finding this seminar with Australia’s first female BJJ black belt inspiring enough, Sophia told us she’s planning to compete at the Worlds in less than two months time, despite the fact her second child will only be about four months old! My BJJ motivation has definitely returned. Sophia Drysdale Melbourne seminar 2013. Glad you enjoyed your first seminar. It’s something everyone should do to enhance their game. Sounds awesome! And I love stealing others notes (I like borrowing a classmates notes for the test, you pick up something different). I really like the waterbed reference – I know it, conceptually, but have trouble getting my body to play along! Am looking forward to the possibility of a women’s seminar up here sometime soon – just another way to learn and problem-solve. Previous Previous post: BJJ slump. Next Next post: Spreading the BJJ love.